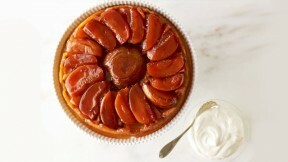 Make Martha Stewart's recipe for apple tarte tatin from the Tarts and Tartlets episode of Martha Bakes. Halve and core apples. Set aside one half. Quarter remaining apples and transfer to a large bowl. Squeeze lemon over apple slices and set aside. Combine sugar and water in a 9-inch cast-iron skillet. Bring mixture to a boil over medium-high heat; immediately reduce heat to medium and cook until mixture begins to thicken and turn amber. Remove from heat and stir in butter. Place reserved apples in center of skillet. Decoratively arrange remaining apple slices, cut side up, in skillet around reserved apples. Continue layering slices until level with top of skillet. Cut any remaining apples into thick slices to fill in gaps. If fruit does not completely fill pan, tart will collapse when inverted. Place skillet over low heat and cook until syrup thickens and is reduced by half, about 20 minutes. Do not let syrup burn. Remove from heat and let cool. Preheat oven to 375 degrees. Line a baking sheet with parchment paper; set aside. Roll out pate brisee to a 10- to 11-inch circle, about 1/8 inch thick; transfer to a baking sheet and chill until firm, about 30 minutes. Place pate brisee over apples and tuck edges. Transfer skillet to prepared baking sheet; transfer baking sheet to oven and bake until golden brown, about 35 minutes. Transfer to a wire rack and let cool 15 to 20 minutes. Loosen pastry from skillet using a sharp knife. Place a rimmed platter over skillet; quickly and carefully invert. Serve immediately. This recipe appears courtesy of Martha Stewart's "Pies and Tarts" cookbook.